Have you ever wondered why more restaurants don’t sell burgers with four, five, or even six patties? Humor me. The burger would either be so big that it’d basically be impossible to eat normally, or the constitution of its patties would be so lacking that they’d be sad and wimpy, void of any actual substance. A select few restaurants do serve such a dish, but the only temptation is their rarity, or oddity, not necessarily how good they are. Either so bloated with unnecessary junk content that it’d take ages from me to attempt to sink my teeth into them, or with a story spread so thin that it’s shallow. In fact, many developer’s selling points, from all genres, are typically based around the length of their title or the amount of content they can cram within one box, good or bad, further muddying the waters between quality and quantity. There are a select few lengthy titles that I’ve thoroughly enjoyed, JRPGs included, and are now an integral part of who I am and what I enjoy when it comes to games. Because of this, I am always open to new experiences from new titles, new genres, and even with revisiting the world of the JRPG. So how good of a burger is Tales of Berseria? Tales of Berseria is the 16th entry in the Tales series and the distant prequel to 2015’s Tales of Zestiria. Originally released in August 2016 for PS3 in Japan, it has recently made its way outside of its home country onto PS4s and PCs around the world. Developed by Bandai Namco Studios, published by Bandai Namco Entertainment, and directed by Yoshimasa Tanaka, Berseria tells the story of a young girl named Violet Crowe who is thrust into circumstances beyond her control after a Scarlet Night brings the Daemonblight, a disease that transforms people into bloodthirsty monsters, upon the Holy Midgand Empire. Attacked by these new creatures, she and her younger brother, Laphicet, are saved by their brother-in-law, Artorius, who is shortly thereafter widowed as his wife, Violet’s sister, Cecilia, succumbs to the disease. Fast forward a few years after that fateful night and the three are living together, trying to survive as a family in a simple country village. Unfortunately for them, another Scarlet Night occurs, transforming the majority of the village into daemons who slaughter the remaining few. Searching for her little brother, Violet flees outside of the city gates, just in time to witness Artorius sacrifice Laphicet in an effort to seal away the Daemonblight. During her attempt to save Laphicet, Violet’s left hand is severed by Artorius, and is imbued and reformed by the Daemonblight into a large claw that can consume other Daemons. Shortly thereafter Violet is knocked unconscious and thrown into a prison, locked away from the rest of the world. 3 years pass before Violet is given the opportunity to escape and take vengeance upon Artorius for Laphicet’s murder. This is the beginning to Tales of Berseria. While much of this story may seem difficult to follow, this was merely a brief summary of the opening hour or so of Berseria, which allows more breathing room between sentences for the player to digest. As in all JRPGs, there is much much more remaining in regards to story lines (main and side) and plot devices, and this is only the start. Thankfully, Berseria’s story doesn’t feel so by the numbers nor as tropey as other similar titles. 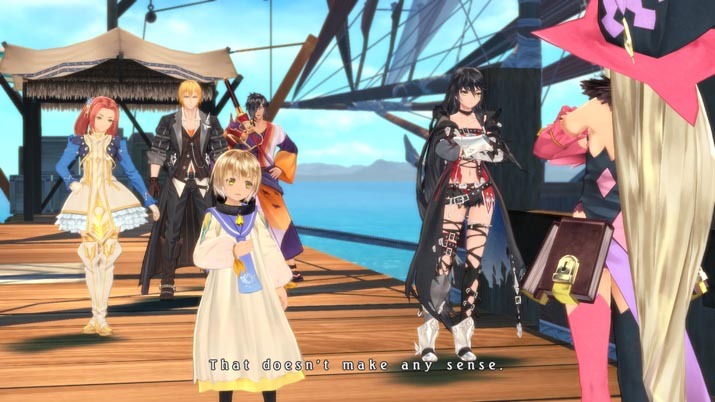 A bit of fresh air, Berseria paints a colorful picture as each cast member is introduced in new tints and hues, complementing and contrasting each other and our titular heroine, but never allowing you to forget that Violet is, herself, a Daemon consumed by pure hatred for a man who brought peace to the world by destroying hers. A person of such character would no doubt attract other unsavory individuals who are less unintentional heroes and more self serving sell swords, thieves, and pirates bound by their own views of what the definition of right and wrong is, or what honor is. This makes the cast of Berseria much livelier, as individuals will have actual personalities that are rough, not only around the edges, but in the middle, too. Egos clash and enemies become allies as the crew cross the land in their somewhat morally ambiguous ways, a mixture of chaotic neutral and neutral evil, with an eventual dash of good somewhere in there. An example of Violet’s new anti-hero outlook and attitude of “revenge at any and all cost” is displayed near the beginning when, while escaping prison, she decides to let other prisoners loose to distract the guards with a riot, knowing that all of them will surely die, but at least she’ll be able to escape. But not everything is a drab, broody, anger fest. Tales is known for their Skits, optional conversations that help flesh out characters and the world they’re in. These Skits are invaluable to story hungry individuals, and are many times well written with humorous insights and interactions between characters. Many of my favorite conversations were from these events and had nothing to do with the main story, only whatever current circumstances our cast was in at the time. One of the reasons these Skits are so effective is, no doubt, the quality of the voice acting. Violet and her crew are wonderfully voiced in both English and Japanese, breathing life into what could’ve been subtitles in any other game. Line deliveries are well timed and easy to listen to, with emotions clearly communicated through character tones and emphasis. This is extremely important in a title that is primarily about an engaging story that encourages and intrigues the player to continue playing. If characters aren’t well developed enough to merit finding out more about them in any type of RPG, you’ve been failed by the developer. This is not so here. Every cast member has a unique voice that embodies their individual drives and aren’t scared to let their opinions be heard. My only caveat would be the odd sound of English voiced NPCs scattered throughout the journey. Many give the impression of someone trying out a silly voice just to see if they can perform it. This in contrast with the more normal sounding Japanese NPCs, making English my less-prefered language to hear, but that certainly doesn’t take away from the main company’s performance, which was always a joy to listen to. Whatever your partiality, you can always switch between the two from the title screen after startup. So Berseria is story heavy, but how does it play? 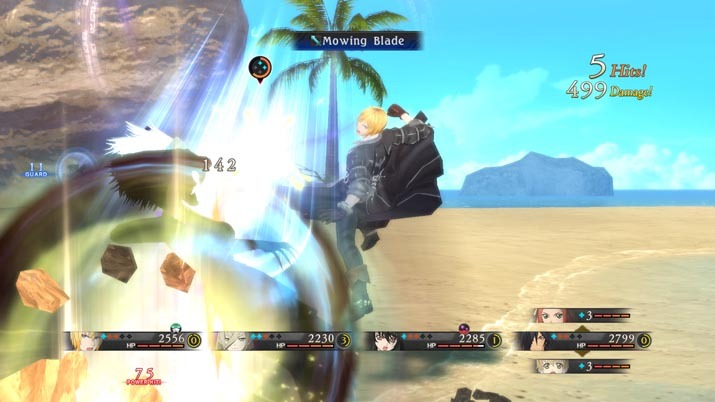 Anyone familiar with the Tales series in general will recognize the, now dubbed, “Liberation-LMBS” (Linear Motion Battle System) from previous titles as a pseudo action combat system where the player controls one character and can move them freely within a designated battlefield area. Attacks take the form of button combos that are completely customizable by the player to suit a specific playstyle or enemy weakness. Physical attacks are given attributes dependant on their form (i.e. blunt, piercing, etc. ), and are sometimes augmented by magic attacks, or Artes. Player attack types are important, as different forms of enemy have various strengths and weaknesses, sometimes even requiring a completely new moveset to be properly dealt with (something you’ll need to do regularly on higher difficulties). Characters can also defend against enemy attacks or actively sidestep and avoid an attack entirely if they dodge at the right time. To prevent someone from simply button mashing through enemies, a stamina gauge called the Soul Gauge has been implemented, allowing up to 5 moves in a combo before exhausting the player. Special moves called Break Souls can be performed whenever a character has 3 or more souls available in their gauge. These moves are powerful and allow a character to ignore their exhaustion level to dish out more damage, but, once performed, transfer an available soul from the player to the enemy, reducing your gauge by 1 and increasing the enemy’s combo ability. Characters can regain any lost souls by defeating enemies, stunning enemies, and several other means like special gear. Depending on how well a battle was fought, the character who performs the final blow will receive bonus experience, a percentage equal to the highest combo performed during the fight. Experience levels up party members and unlocks new skills, but so does equipment. 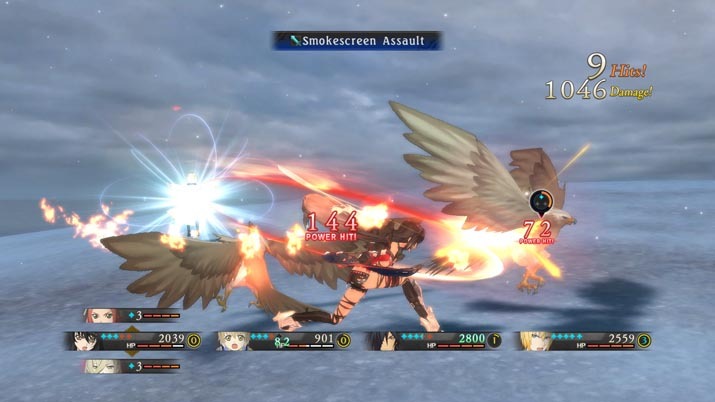 All gear in Berseria are supplemented with upgradable skills that, once mastered, stay with the character, increasing the effectiveness of gear with similar properties they equip in the future. In my experience, combat began as a bit of a slog with a small combo and limited ways of increasing the Soul Gauge, but as I became familiar with the mechanics and leveled up my characters, combat felt faster and more rewarding to engage in and experiment with. Visually, Berseria isn’t all that impressive compared to most modern offerings, mostly due to the fact that this is an upgraded port of a PS3 title, but that doesn’t mean it isn’t pretty. Berseria gives the look and feel of a balance between cell shaded cartoonism and delicate watercolors with the way characters are animated and colored. It’s a simple, yet effective way to make something look appealing without pushing any type of graphical limitations. Characters animate fluidly and emotions are well conveyed through both voice over and facial animations. The pseudo comic strip style of optional conversations throughout are another fine example of effective minimalism in action. The crisp edges of the linework along with simpler animations help give these interactions a lighter feel, which is especially appropriate for their usage. Overall, while Berseria may not look amazing or take full advantage of current systems, it does do a great job of looking cohesive and well put together. There aren’t any visuals that seem out of place or completely adventitious. The music of Berseria is also beautifully performed and recorded, thanks to the sensibilities of composer Motoi Sakuraba. The ebb and flow of many melodies, from Velvet’s theme to even the main menu track pulse with exquisite grace, easily heard from each piano key and choral voice. Battle themes surge with rock beats and overdriven 80’s inspired leads, reminiscent of classic rock ballads. Each track within Tales of Berseria is overflowing with a resonance fitting for a title as grand as such. A central line can be drawn between tracks via similar instrumentation and influences helping everything come together into a cohesive and well-rounded piece of music that continuously builds and progresses the story and the action, even capitulating to it when necessary. Each character’s personality and motivations can be heard in each of their respective themes, from the innocent hopefulness of Laphicet’s to the playful and mischievous nature of Magilou’s. Music within a JRPG is expected to be a large part of the experience, as players will be spending a large portion of their time listening to many BGMs. Thankfully, Berseria’s attention to detail means it does not disappoint. Included in this attention to detail is the amount of options in the menus. System settings allow you to change bindings you aren’t happy with, and graphical settings allow you to change… you guessed it, graphics. More specifically, you can change resolution, Vsync, 30 or 60 fps caps, and many more, opening this title up to a variety of desktops. Sadly, every rose has its thorn(s), and Berseria is no exception to this idiom. On my initial launch, everything sounded great, the intro video played perfectly, but then the title screen came into view at an excruciatingly slow fade in as Violet’s footsteps were heard at a brisk pace in contrast to the slow animation of her character on screen. “That’s odd,” I thought, and started up a new game. What happened next was the most awkward and confusing cut scenes I’ve ever come across: Every character was moving in slow motion, but their sounds were played at current speed. I immediately closed and restarted the title to find the same slow motion intro and beginning cut scene. I pushed through, painfully, until I took control of my character. They, too moved in slow motion. In an attempt to play through I changed to frame cap to 30 fps, which worked, but made everything animate choppily, almost as though it were actually played at 15 fps. I closed the application, restarted my computer, and gave it another go: success! Everything played buttery smooth without hiccups after that… until the next time I played where it would slow down again. Fortunately, it’s easy to rectify currently, and the dev team is aware of and actively patching such issues, along with others found http://bit.ly/2lr8qQT, http://bit.ly/2lroKRB, and other forums. There’s much more to discuss regarding the latest Tales offering, but I would encourage the player to discover these on their own. For the returning Tales fan, Berseria is no doubt an insta-buy, but for those who are curious or have never played an entry, this is the perfect place to start. Tales of Berseria offers quite a bit in terms of exploration, combat, and story, and does so in a way that is easy to digest and tasty enough to keep the player coming back for more. “Filler” content is presented in an attractive way that it doesn’t feel as though it’s inhibiting the player from completing goals or traveling so far off the beaten path that they forget where they started. Combat is fluid and engaging once the learning curve has been met, leveling and upgrading equipment is streamlined and allows for a plethora of choices, but most important of all, story and character interactions are top notch. 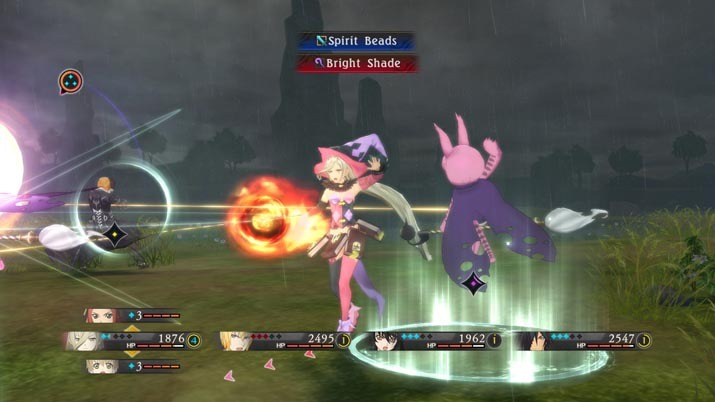 A JRPG is often defined by their story, and Tales of Berseria goes above and beyond to shatter player and genre expectations with a performance that engages the player from start to finish. Regarding the finish, there’s also bonus content and post-game dungeons to explore and continue one’s experience. Multiple difficulties that can be changed at the player’s whim provide even more challenge and replayability to an already rewarding and entertaining title. If you’re still wondering whether or not to purchase this title, don’t. Because the answer is a resounding yes, do it. Experience what Tales of Berseria has to offer on your own. Don’t just watch a let’s play or read a synopsis, taste it for yourself. A burger this good isn’t common these days, and boy, do I like burgers.